Appetite for Acquisition: How Can Small Food and Beverage Manufacturers Stand-out to the Bigger Players for Investment or Acquisition? Consumer appetites are evolving quickly and certain food and beverage (“F&B”) sectors continue to grow. People are demanding “clean” products with minimal ingredients and clear labeling. They search for products that are gluten-free, chemical-free, organic or non-GMO. Big F&B manufacturers like Kellogg and General Mills (“strategics”) who are not meeting these standards, are experiencing minimal revenue growth in their traditional products. To retain market share, strategics are stepping in earlier than ever to acquire or invest in emerging F&B companies with revenue as low as $20 million. It is cheaper and less risky for them to invest in entrepreneurs who understand the consumers evolving tastes and go-to-market strategy, rather than spend millions internally on R&D that proves to be unsuccessful. Similarly, private equity and venture capital firms (“investors”) are also are stepping up to help emerging brands gain market share while they receive high returns on investments. How does a F&B entrepreneur position their business, to be attractive to investors and strategic buyers? The entrepreneur needs an in-trend product, an effective marketing approach and scalable manufacturing capabilities to meet growing demand. Emerging F&B categories that emphasize healthy eating are seeing the strongest growth. 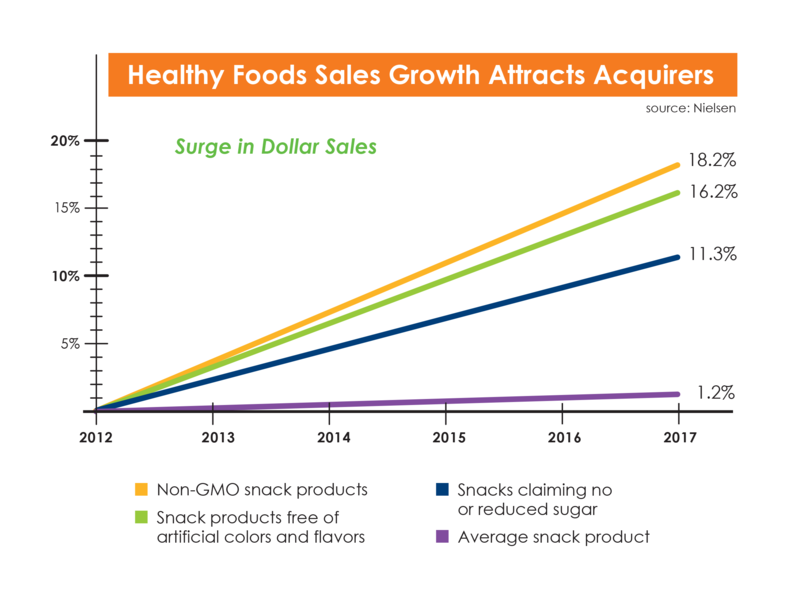 Non-GMO snack products are leading the way, with an 18.2 percent surge in dollar sales for each of the past five years. Sales of snack products free of artificial colors and flavors were up 16.2 percent, while snacks claiming no or reduced sugar were up 11.3 percent, according to a report issued recently by Nielsen. By contrast, the average snack product has seen an increase of only 1.2 percent over the same period. 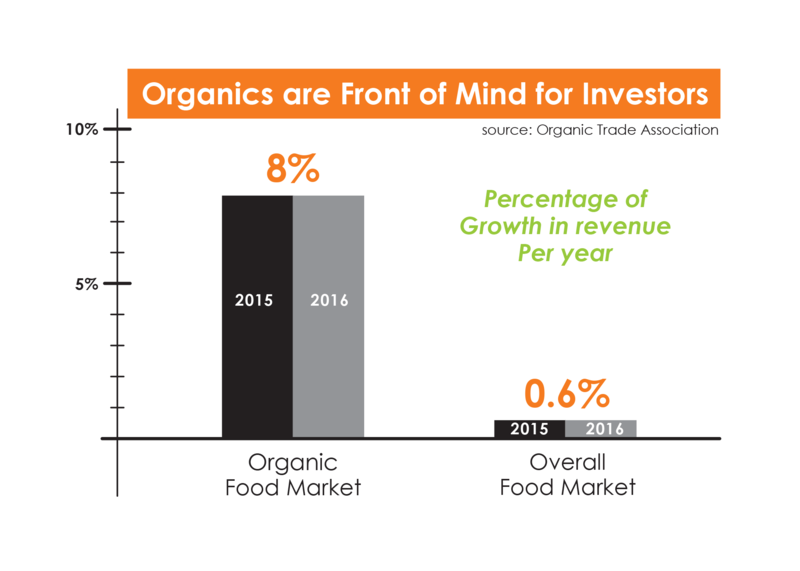 Organics is an appetizing area that accounts for more than 5 percent of total food sales in the U.S. Organic revenue increased approximately 8% in both 2015 and 2016 with $47 billion in revenue in 2016 according to the Organic Trade Association. The organic growth trend compares to the 0.6 percent growth in overall food market in recent years. Plant-based food is one more F&B category on the rise as products like soy and almond milk outpace cow-based dairy products. Nestle predicts plant-based foods will represent a $5 billion market in the U.S. by 2020. With that growth comes increased interest from financial and strategic buyers. Evidence of such interest is seen with the capital raises by Beyond Meat, whose tagline is “the future of protein.” The latest fundraising for this plant-based meat company reached $55 million. These funds were added to the $90 million already secured from previous investors such as Bill Gates, Twitter co-founders Biz Stone and Evan Williams, and actor Leonardo DiCaprio, per a report issued by Forbes in December 2017. Investors target emerging F&B companies that understand how to reach their customer base and market the brand. Investors look at a variety of factors including does the product have strong social media influences, or relationships with people who can build relationships for you. Influencers can boost a small brand—or they can break it. The most recent impact of social media influence was seen when Kylie Jenner criticized the use of Snapchat, leading to the company losing $1.3 billion in market valuation overnight. When marketing dollars are in short supply for emerging F&B companies, they must be strategic and focus efforts on the local area where they can make the most impact first-hand. An example of an effective marketing strategy is in-store sampling. It can build awareness of the brand while also allowing the business to receive immediate feedback on the product. There is also nothing more impressive than the company founders showing their passion for their product and interacting with customers. More good news for F&B companies is they do not have to rely on shelf space at a grocery chain to reach consumers. The Specialty Food Association reports that alternative selling channels including direct-to-consumer sites like Amazon and third-party e-commerce platforms account for 36 percent of specialty food and beverage sales. A F&B company just needs to make sure when selling online, it can meet the exponential demand that can come from a wider consumer base. Besides marketing efforts, emerging F&B companies need to focus on manufacturing capabilities to meet demand. A quick way to lose a customer is to be consistently out-of-stock of products. Once demand is strong enough, finding the right contract packager or copacker is not easy. A F&B company needs a co-packer that manufacturers its product with the right ingredients, specifications, and quick turnaround to meet demand. There are many challenges to working with a co-packer; most of which can be eliminated by having open and consistent communication with them. A F&B company must be extremely detailed-oriented, providing clear guidelines to the co-packer on the ingredients to use and manufacturing process (i.e., recipe). Co-packers usually manage sourcing ingredients directly with the supplier, but a F&B company negotiates the supplier agreements and freight contracts. A F&B company also must ensure the co-packer has a clean facility and efficient process. With all the recent investment in emerging F&B companies, there has been a significant change in acquisitions – independence. When strategics acquire emerging brands, they allow the target to continue operating as a standalone business rather than consolidate. Kellogg’s acquisition of RX Bar is a classic example where post-acquisition, RX Bar continues to operate with the founding management team. Kellogg’s has provided capital and distribution contacts that allows RX Bar to grow exponentially faster than it would have had it continued independently. Emerging F&B companies have a uniqueness in culture and/or process that strategics do not want disappearing once acquired. They also do not want to disrupt the brand, or rebrand the product. Strategics are typically willing to pay a higher purchase price than financial buyers, which means financial buyers need to find ways to stand-out. Financial buyers can compete against the Nestles of the world by focusing on a specific F&B niche. CohnReznick’s client and private equity firm VMG Partners has made investing in natural food products part of their core strategy, with successes that include Daily Harvest, Health Warrior, Kind Healthy Snacks, and Nature’s Bakery. A firm like VMG focuses on leverage synergies and economies of scale like sourcing better ingredients or using the same marketing message across portfolio companies to gain higher return on investments. Never has the opportunity for emerging F&B companies to raise capital at high valuation multiples been as great. Companies can retain their individuality, while gaining the advantages of economies of scale, distribution network and structure to speed growth. Emerging F&B companies need to focus on solving a customer need, clean product labeling and messaging, reliable quality co-packers and smart, cost-effective distribution.